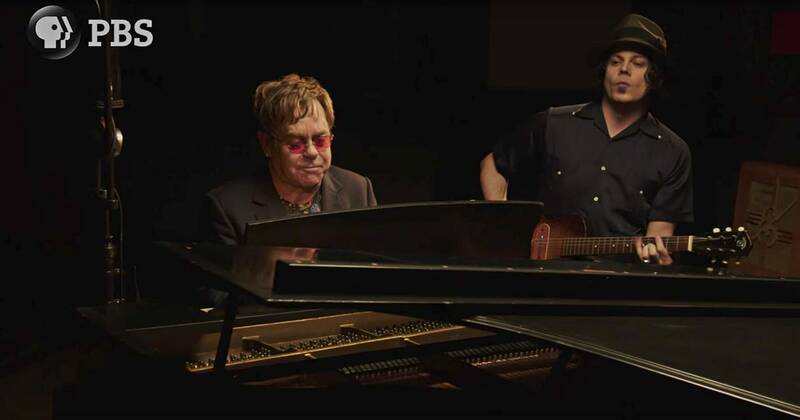 Elton John and Jack White barrel through a rowdy new paean to inebriation, "Two Fingers of Whiskey," in the latest clip from the forthcoming documentary, The American Epic Sessions. On piano, John drives the jaunty melody with his left hand and adds colorful embellishments with his right. "Two fingers of whiskey, that is all I need to keep drowning the devil livin' in me," he drawls like a vexed man on a barstool. To his side, White quietly picks a terse rhythm guitar and a scant solo during the bridge. The American Epic Sessionscaptures a number of musicians including Beck, Nas and more, as they record old standards and new tunes with vintage 1920s equipment. The film follows American Epic, a multi-part PBS documentary – executive produced by White, T Bone Burnett and Robert Redford – that examines the history of recording technology and popular music in America. The creators present the series as a chance to prevent the erosion of cultural memory. "All of us have a common foe, and that's forgetfulness – where you forget where you came from and who you are," Burnett explained to Rolling Stone. "We all appreciate that link to our history. We need that." The American Epic Sessions airs June 6th on PBS, and an accompanying soundtrack album arrives June 9th.